visa arrangemets at the Russian embassy. Travel to Russia Crimea and Sevastopol Russian Visa, Tourist, Business, Multiple-Entry, Travel Russia Visa Support Invitation Services. The best way to travel to Crimea is by air to the international and domestic airport of Simferopol (SIP). You may reach Simferopol airport the fastest thru many Russian airports without any problem. Some of the airlines providing services to Crimea are: Aeroflot, Skyscanner, Transaero, Ural Airlines, Orenair, Red Wings, Aviasales, Ozon Travel, Vim Avia. When you arrive at your airport (departure) you have to see at the monitors at with number you have to complete your check in. This is the first place you should visit. The right departure times are printed at your ticket but at the monitors are the delays shown. For international Flights you are expected to check in about two hours in frond! At the check in you deliver your luggage, show you ticket and passport. This is the place where you receive your "boarding pass". At this boarding pass you will find your "Gate" and the number of your chair in the airplane and the time that you have to be at your gate. With this boarding pass and your passport you can pass customs. Take care you don't get lost and lost in time at the tax free zone! At your arrivel at the airport of Simferopol, you can let Kozak Travel take care about the necessary transfer to your accommodation booked by us. At the airports are of course taxis available, but most of the time they are far too expensive for tourist who they dare to over ask up to 5 times the real price. The airport taxi's are from Simferopol and specialist in their area but not well known with the streets and places in Sevastopol or the rest of Crimea. Simferopol airport and Sevastopol are 120 km apart! When you let us take care about the transfer the driver we will wait you at the exit of the arrival hall holding a sign with your name. He will bring you right away to your accommodation. Please inform us if you wish to use our transfer service at the booking form or by email. Together with our offer for accommodation, tours, excursions of your request we will inform you about the transfer price to your destination. 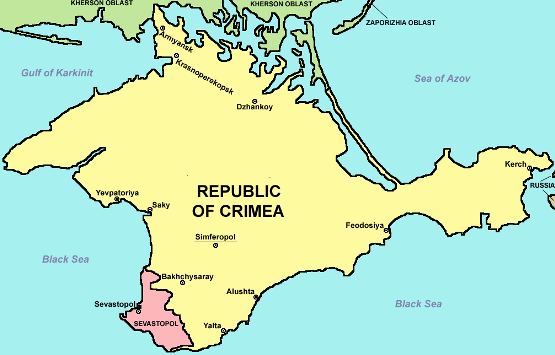 Foreigners need Russian visa to visit the Republic Crimea and the Federal city Sevastopol. A Russian visa has to be obtained from a Russian embassy or consulate in order to enter the Crimean peninsula. Following the reunification of Crimea and Sevastopol with the Russian Federation, a foreign citizen will need to receive a Russian visa in one of the diplomatic or consular missions of the Russian Federation. De beste en snelste manier om aan een visum voor Rusland te geraken is niet een persoonlijke of toeristische uitnodiging van mij. Dit omdat de ambassade in dat geval orginele documenten uit Sevastopol vraagt te overleggen. Dit zal een probleem zijn vanwege de lange duur per post. Wij adviseren u voor uw visa aanvraag gebruik te maken van de services van de ANWB in Nederland. Voordelen, Handig, snel én veilig! When you book your accommodation with us, we will provide you with the required address of your stay to apply for your visa. It is sensible and obligated to have travel insurance during your whole holiday or business trip.